A sliding sash window is a type of window that is made from more than one moveable part, with sash referring to the frame that holds the glass in place, with them generally moving horizontally or vertically. Sliding sash windows in our opinion never go out of fashion or style and are a sophisticated choice for your home. Modern sash windows reproduce the beauty and style of traditional sash windows while making them easier to care for, to clean and more importantly they are energy efficient. 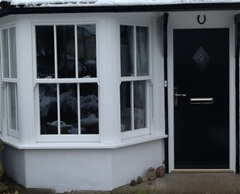 These windows are practical and virtually maintenance free so it is no wonder they remain as popular as ever in the UK. Markwell supplies and installs sliding sash windows that are sympathetic in style yet we believe are also innovative in their design. We offer these windows in a range of prices and we have a good choice of colours and materials to choose from, ranging from Rosewood and Light Oak to standard white, so there is something that will suit any home. Our windows are double glazed to comply with current building regulations, this help to improve the energy efficiency of your home all year round and helps you to stay warmer in winter yet cool in summer. Our sliding sash windows also have multi-point locking systems for enhanced safety and peace of mind and we offer a ten year guarantee on our entire range to back up the quality of our products and our installation. If you are interested in installing sliding sash windows in your home and live in Essex, Hertfordshire or the surrounding areas, please give us a call today to request a no obligation, competitive and hassle free quote. We are happy to answer any questions you may have on Sliding Sash Windows or any other windows or door questions you may have.